Heritage Days | Square Dance Minnesota, Inc.
August 3, 2018 – Heritage Days Square Dance demo, Clearwater, Caller Abe Maier. Two squares with dancers (see photo above) from Spares & Pairs and County Line Squares danced provided a square dance demonstration and danced with area royalty and other visitors. 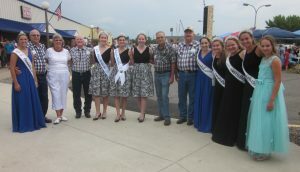 Area royalty and some of the square dancers. This entry was posted in Activities on August 4, 2018 by LeRoy.